Several years ago I sold a bunch of cars by advertising with Cars.com and Autotrader.com . I’ve used them both and had pretty good results as long as I was doing my research on the huge number of competing vehicles that are listed on their site. I would suspect however, that if a dealer just slapped them on, it might not be a good investment. Times have changed and Google is much more sophisticated than it was back when Autotrader.com and Cars.com were in their hay day. 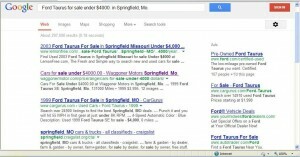 It is easier for buyers to simply type the vehicle that they are looking for into a Google search. Your website can prove to be a far greater tool for selling your cars than advertising with Cars.com can ever be. If you’re a car dealer and you don’t have a Website, I would suggest that you get one before you get too invested in 2nd or 3rd party on-line ads. It is possible to get lost in the crowd with Cars.com. This site has tens of thousands (if not more) vehicles listed. In most cases they will have dozens of vehicles for sale that are going to be very similar to yours. If your car doesn’t have the lowest price or the fewest miles you may be paying Cars.com to brand their website. It makes more sense to get those buyers to your website where they will be comparing the prices of your cars without all the distraction. You will get more buyers and more repeat and referral business with proper Website management and SEO than you can with Cars.com (or Autotrader for that matter). All second party websites (cars.com, autotrader, craigslist, etc.) use your inventory listings to promote their site. You should be using your inventory to promote your own site! Website management and SEO that will get your inventory on the first page of Google. By performing proper Website Management and SEO buyers can find your vehicles in their first Google search. I know that you would you rather have buyers comparing one of your cars with the other vehicles on your website than with one of your cars with the almost countless other vehicles on Cars.com. Times have changed, take control of where your buyers see your cars! For a fraction of what it costs to advertise with Cars.com we provide the SEO that will get your inventory where the buyers are, on the first page of Google. Does it help to Optimize Your Car Listings or would your advertising dollars be better spent with Autotrader or Cars.com? When you advertise with cars.com or autotrader.com you do get exposure and at the same time, so do thousands of other dealers, with tens of thousands of other vehicles (are your cars priced lower than the rest of them?). If you Optimize Your Car Listings you will get more exposure without the distraction of your competitors. This creates traffic to your website and your store with a greater percent of repeat and referral customers. The more customers that search Autotrader or Cars.com for their next car the smaller you become and the bigger Autotrader.com or Cars.com becomes with your potential buyers. If you chose to aggressively optimize your listings and you begin to show up ahead of Autotrader.com or Cars.com in a Google search, then you are more likely to capture those new buyers. What I’m saying is: Using these directories to list your vehicles is a bad thing and that you shouldn’t do it! Exposure is not exposure! However, for a fraction of the money spent on advertising with an outside directory and improving their brand, you could be showing up in the initial search that most people do on the internet when they make the decision to buy another car. All the time that you are showing up on the first page of Google you are advertising to more buyers and you are improving your own brand. 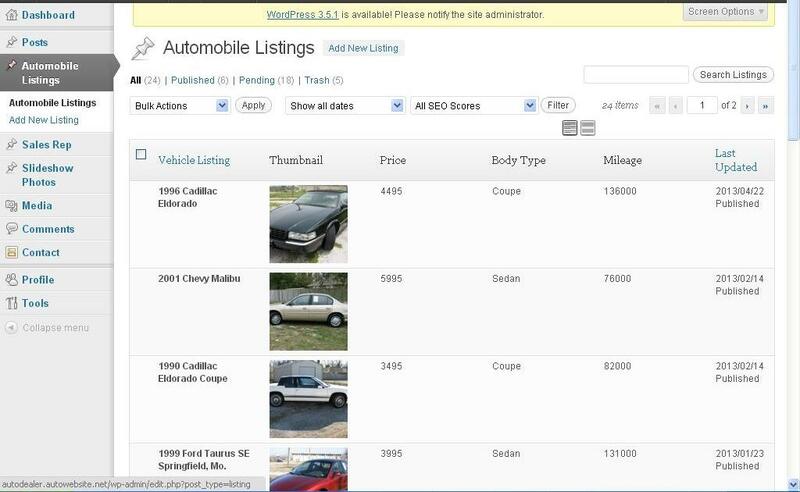 If you “Optimize your car listings”, you will be providing better service to your customers. 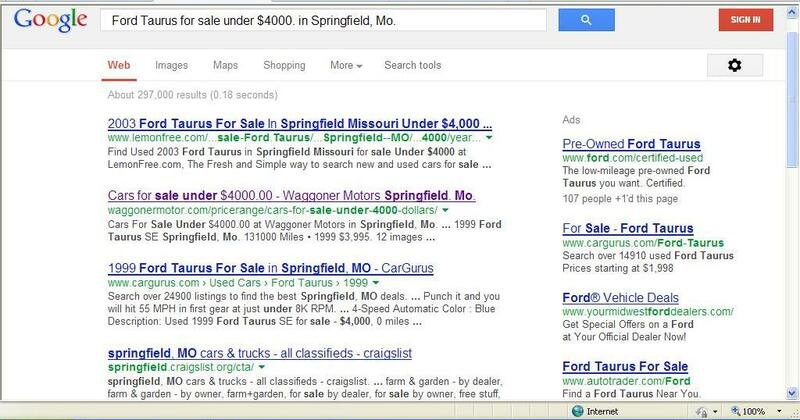 Your potential customers (the people who search the internet) want to see cars for sale in their area. Whether or not you Optimize your car listings, will determine if and where each and every vehicle that is on your Website will show up in a search. Some one out there would love to know that you have a Ford Taurus for sale under $4000. and if it showed up when they typed “Ford Taurus for sale under $4000. in (the name of your town)” into a Google search because you Optimize your car listings… It’s likely, that you both will be happy! Ford Taurus, Optimized to be visible in an internet search. This is where we come into the picture. Optimization is an on-going process of matching you and your products with the buyers who need or want them. This is done by getting you and your products indexed by the major search engines. As soon as you say go, we begin an SEO optimization campaign for your vehicle listings. Web traffic is influenced by seasonality, current events, and a number of other factors. The number of searches on your keywords, therefore, is constantly fluctuating. Execution of the above steps requires an extraordinary investment of time and thought, but it lays the foundation of a successful campaign and the satisfaction of doing the job right. Once this ground-work is laid, we begin the monthly SEO campaign. The focus of the campaign is simple: to further increase our clients rankings, Web traffic, and profitability. The methods will vary based on the season and the target audience. What will not vary is our commitment. Contact us today and take control of your online ads! The Admin Dashboard is where you will log in as a dealer to add your vehicle listings. This content management system is straight forward and selected specifically to create the ground work for enhancing your vehicle listings in a search. The Auto Dealer Website Admin Dashboard is easy to navigate and the starting point where you will be able to show prospective buyers what you have to offer. In this area you will be able to upload dozens of photos and even add your own dialogue if you like. 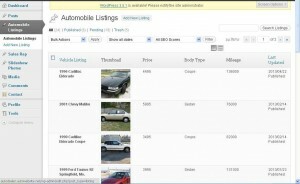 Once vehicles are added to your site we will begin optimizing each listing. This is an on-going process. Once this ground-work is laid, we begin the monthly SEO campaign. The focus of the campaign is simple: to further increase our clients rankings, Web traffic, and profitability. The methods will vary based on the season and the target audience. What will not vary is my commitment. The web design and SEO are both keys to get your vehicle listing showing up in the front row (online) where real buyers are looking for the right vehicle to buy.